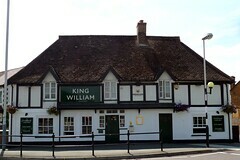 Greene King pub in Sipson, previously known as the King William IV photo. On Easter Sunday in March 2007 the front of the bar was full of people; quite a few watching the football and what seemed to be a large family get together. However the back room, which can seat 30, was empty. In the back room there was music playing quietly. When bob first visited in March 2007 the Greene King IPA (£2.65/pint) was very good. In April 2019 they had Greene King IPA (£3.70/pint) and Old Speckled Hen on, and the IPA was again well kept and drinkable, which is unusual. According to a menu as of April 2019, food is served noon-3pm and 5:30pm-9:30pm Mon-Fri, 12:30pm-9pm Sat, and 12:30pm-8:30pm Sun/Bank Hol, including Thai food. In March 2007 bob had a cumberland sausage with mash (£6.25) and some onion rings photo. The sausage was very tasty although the gravy was a bit too hot. In April 2019 bob had duck pad krapow (£8.50) photo, which was decent enough but perhaps not spicy enough for bob's taste. Child-friendliness: They have at least one highchair with tray. Accessibility: A large step to get in. It's level once you're inside, but some of the ceilings and doorways are quite low and the gents' is quite cramped. Last visited by bob, April 2019. Last edited 2019-04-20 09:54:15 (version 6; diff). List all versions. Page last edited 2019-04-20 09:54:15 (version 6).